So said Sophie Davis in the late 1930s. Sophie Davis was born to slaves who worked on St. Catherine’s Island along the coast of South Georgia. She did not know what year she was born, but she was eight years old at the time of the war that would result in her freedom. After the war, young Sophie and her family were among the former slaves from St. Catherine’s Island who settled several communities along White Bluff Road south of Savannah: Rose Dhu, Cedar Grove, Twin Hill, and White Bluff. One group of the freed slaves negotiated with John Nicholson of the Cedar Grove Plantation south of Savannah to purchase 200 acres of his plantation. They named their community Nicholsonboro and built the Nicholsonboro Baptist Church at its center. My best guess is that the land where I now live and garden was either a part of the Nicholsonboro community or very near it; anyway, most days, I walk my dog past the Nicholsonboro Baptist Church, just a block and a half toward the river and across White Bluff Road from my house. I’ve written about Nicholsonboro here and here and here. In the late 1930s, someone from the Georgia Writers’ Project came to these communities along White Bluff Road. They were a part of the Federal Writers’ Project, a program of the Works Progress Administration, part of the New Deal to try to get the United States out of the Great Depression. The purpose of the Federal Writers’ Project was to record in writing oral traditions, local histories, and other such information. In 1940, with the information they gathered in their study of the communities of White Bluff, they published a sort of anthropological ethnography called Drums and Shadows. Since the copyright was not renewed on it, the entire text can be found here; the section on the White Bluff communities can be found here. Drums and Shadows focused primarily on the folk traditions of the former slaves: mystical traditions, ghost stories, folk remedies, and other “primitive” aspects of culture. The book is respectful enough, if condescending in that way academic ethnographers tend to be. The words of the writer are in precise, proper, academic prose; the pronunciation, syllables and grammar of the subjects are literally transcribed in their Gullah accents in ways that make them sound illiterate. But there is interesting information here for those of us who want a picture of who lived on this land before us. I would be fascinated to learn about this Cherokee bush which Sophie Davis and Susie Branch described. I would love to plant some of it near my front door; who couldn’t use a little more good luck? But I would also be fascinated because this time of year in the trees and shrubs which line Old Coffee Bluff Road, across the street and down a bit from the Nicholsonboro Baptist Church, blooms a beautiful specimen of Cherokee Rose. And I wonder if that could be the same bush Sophie and Susie described. The Cherokee Rose, pictured above, is a large, creamy white, single rose with a pronounced set of pollen-makers protruding in a ring around a yellow center. It is a beautiful, if simple, plant which grows wildly around here. And it has its own story. In 1916, the Georgia Federation of Women’s Clubs lobbied the Georgia General Assembly to name the Cherokee Rose as the state flower of Georgia. It seems the Georgia Federation of Women’s Clubs had adopted the Cherokee Rose as their emblem when they first formed as a statewide federation twenty years earlier, so, I suppose the logic went, why not remedy the lack of a state flower by promoting the symbol of their own club, which happened to grow as if it was wild all over the state? Sophie Davis and Susie Branch would not have been welcome in such a company of “exotics of civilization,” and for a lot of reasons in addition to the color of their skin. But imagine that “dis lil bush” which Sophie Davis and Susie Branch described is the same as the state flower and symbol of the Georgia Federation of Women’s Clubs. And imagine that I planted a specimen of it here, near my front door, in the soil of this community. The meaning of that bush would be taken away from those women who, without much of what I would consider grace or tact, bragged of their rearing in their parents’ “lap of luxury.” Instead, its meaning would be defined by survivors of one of the most awful systems of oppression our nation has ever conceived. It would be given its meaning by women whose families had enabled those “exotics of civilization” to live with the decadence to have “more time at our command than ordinarily falls to the lot of women.” Its significance would have been granted by people who were denied the ability to exercise their right to vote for those who considered such important business for the good of the state as that which was presented by the Georgia Federation of Women’s Clubs. Sophie and Susie were Southern women, every bit as much as Rebecca Lowe and her subjects in the Women’s Clubs. But, although these Southern women could not exercise power in the way the Georgia Federation of Women’s Clubs could exercise power, they had a power all their own: the power to cultivate good luck for themselves, their families, their neighbors, and their communities, right at their doors, with their own strong hands and hard work. As much as I would appreciate the layers of ironic meaning of a specimen of Cherokee Rose growing in my yard, I have my doubts that it is the same bush which Sophie Davis and Susie Branch described to their visitor from the Georgia Writers’ Project in the late 1930s. The bush they pointed to was described by the ethnographer as “a small bush growing beside the doorway of her little cabin.” The Cherokee Rose, though, is a vine with long, trailing stems; the ones blooming now across the street from the Nicholsonboro Baptist Church climb forty feet or more up the trees and power poles. A friend who lives not far from me showed me her Cherokee Rose the other day, trailing along her low, split-rail fence near her driveway gate. She said with a smirk that I should be grateful she finally trimmed it back; if she had not, it would have had me for lunch. Unless Sophie Davis and Susie Branch worked each year to cut theirs back hard, the bush could not be described as small. Still, I would like to know what the Cherokee bush they talked about is because I would love to plant one near my front door. Who couldn’t use a little more good luck? 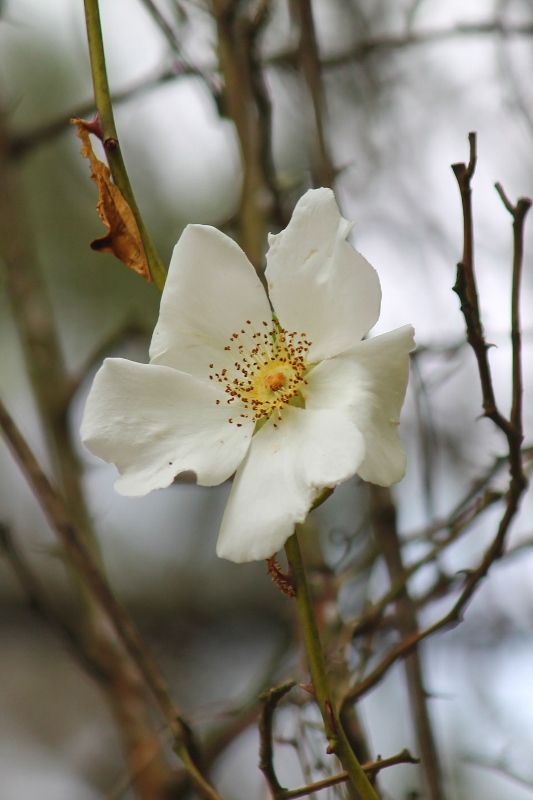 A footnote: There is a further irony in the story of the Cherokee Rose. In the resolution which the Georgia Federation of Women’s Clubs drafted and the Georgia General Assembly approved in 1916, among the supporting arguments, was this claim: “…The Cherokee Rose, having its origin among the aborigines of the northern portion of the State of Georgia, is indigenous to its soil…” The Cherokee Rose is not, in fact, indigenous to Georgia. It is native to China, Taiwan, Laos, and Vietnam. In one of those mysteries of globalization, née colonial trade, it probably came here to Georgia by way of England, probably only a little more than a century before the Georgia Federation of Women’s Clubs adopted it as their emblem. The Cherokee Rose found itself mixed up in the same systems of transatlantic trade as the ancestors of Sophie Davis and Susie Branch and millions of people like them. It is an immigrant to Georgia; maybe it came here with the intent to dominate the land and people, like Rebecca Lowe and her ancestors, or maybe against its will, like Sophie Davis and Susie Branch and their ancestors. But it is not a native species. The other day, I was a bit grumpy. The weather can do that to me sometimes. Or, at least, I like to blame it on the weather. It was about 75 degrees, and it was the 11th of December. That is not the way things are supposed to be. Don’t get me wrong; on summer days-off, I am as happy as the next guy to enjoy a warm day. I go out in my shorts and t-shirts and sandals without a care in the world. On days when I have to work, I can’t very well wear shorts and t-shirts and sandals. For work days, I have shirts with collars, pants with long legs, belts, hard-soled shoes, and all manner of other layers which stifle and bind me. In June, at the bright and fresh turn of the season, I can make it all work. But by December, I am just stuffy and sweaty and miserable, and I feel like I deserve better. 75 degrees is just wrong for this time of year, and I was a bit grumpy about it. But there was one bright spot in the midst of the injustice of a 75-degree day in December: fresh basil. When I came home from work for lunch, my wife and I had our regular conversation about what to eat. And I looked out of the window in the nook, and I knew the answer. “I want pasta with pesto.” I got out the pan and started the water, then I headed outdoors with our kitchen scissors to cut the leaves off of the basil. Around here, I have found it makes most sense to plant the basil twice each year. In March, I can usually find the first round of herbs at the nursery. I put them in a place of prominence in our small herb bed, a little patch enclosed by a small wall of flagstones salvaged from a pathway we removed from the side yard a couple of years ago. The pathway had become overgrown as stolons of centipede grass meandered across the stones, pushed their roots into the cracks in between, and took up residence in a way that made it clear they had no intention of leaving. Removing the grass would have been a tedious job at best. So, we just pulled out the stones, and now I simply run the mower out there when the weeds get so high that we are scared to approach our back-yard gate for fear of what might be lying in wait for us. The early-spring basil is usually planted in the sunny side of the herb bed, as far away from the house as possible without going into the lawn, so it can enjoy the full day of warm sun which it prefers. But there is no reason to assume in March that the basil will have any permanence there. By late June, the basil is feeling the steaminess of a Savannah summer. Its leaves wither, turn yellow, and fall off the stems, and the plants’ full efforts are put into desperate attempts at reproduction. As soon as I pinch off one flower bud, another one shoots up. We usually get out of town for a few days around that time, and when we return, the basil is hopeless. But in early September, I have found that I can go back to the nursery, pick out a four-pack of fresh, young shoots, and put them in the same sunny side of the little herb bed. The plants need a bit of watering at first to mitigate against the late-summer heat, but then, they settle in nicely. As the weather cools a bit, they do not seem to feel any urgency to produce flowers and seeds, so we can simply cut the stems as we need to use them. Some years, we can get a freeze as early as mid-November. But this year, like many years, it is almost Christmas and the air has still not reached the fatal 32 degrees. The basil survives. I collected my basil, cutting the stems back further than I would another time because I might as well use it before it is gone. Some of the stems might have been a little too woody, so I probably should have pulled off the leaves. Next time, I probably will, but that day I threw stems and leaves together in the food processor with the requisite amounts of pine nuts, grated Parmesan, garlic, and olive oil to make the coveted paste. By the time the macaroni had reached al dente perfection, the pesto was well-mixed and ready to be spread liberally. An otherwise grumpy day of dealing with the merciless, unseasonable weather was redeemed by the abundance of the autumn basil. I had a chance to reflect a bit more on this season, and how abundance is revealed in it, the next day when I was talking with the director of a church organization I work with. This organization works with seniors who have low incomes. The director told me that another congregation had collected some money and given it to the organization to help the people they serve have a merrier Christmas. And when the director received the donation, she knew exactly what to do with it. She has noticed that one of the organization’s clients is always wearing the same pair of pants. That man told her one day recently that all he had for breakfast that day was some toast because he had no other food in his small apartment. She set him up with a food pantry and other services, but when he told her about his struggles, she realized something. He does not wear the same pair of pants all the time simply because he finds those pants comfortable or because he has some quirk of personality that makes him want to wear the same pants all the time. He wears that pair of pants every day because it is the only pair of pants he owns. She will use the Christmas donation to buy this man some new clothes. There are a lot of things in life that can make me grumpy. A stuffy, sweaty day in what should be a winter month can make me grumpy. The fact that there is an elderly man who cannot afford food for his breakfast makes me grumpy. But in this season, abundance is revealed in a lot of ways, too. It is revealed through autumn basil which provides fresh pesto in the ides of December. It is also revealed in a collection of cash which provides an old man with some new clothes. Thanks be to God. Content and photos copyright 2015, Eric Beene. Unauthorized use and/or duplication of this material without express and written permission from this blog’s owner is strictly prohibited. Excerpts of text and links may be used, provided that full and clear credit is given to Eric Beene with appropriate and specific direction to the original content.